When I went to bed that night, all I could think of was, “I should have gotten at least a couple shots,” and frankly, I am embarrassed to admit this, but yet here I am being totally honest…it kept me up for an hour lamenting the lost salad shot. I think if you do a WordPress or Google search under crazy, my blog pops up as number one! 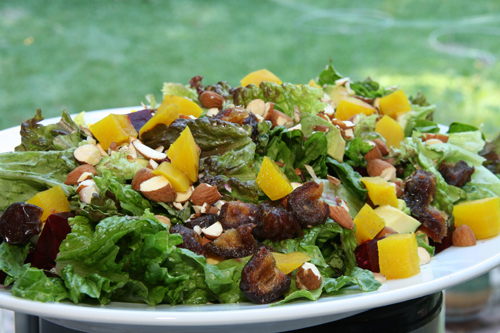 Well let me tell you this salad is no charlatan, it is good from the inside out with organic greens, steamed sweet golden and red beets, Medjool dates, toasted almonds, ripened but firm avocados and homemade, finger-licking good delectable champagne vinaigrette. I served it on a big white platter to show off the natural splendor of all the vibrant jewel tones that adorned the greens and placed a big basket of homemade zucchini bread aside it. I also had made couscous stuffed zucchini to complete our Mediterranean fare. There are a few before pics of the stuffed zucchini in the “how-to” below, but no after photos, and they were pretty hot little numbers themselves. The bread was pretty too, but I didn’t get one photo of that either. Alas. Sigh…I guess the recipes will just have to do for now. Beet note: Salads are pretty self explanatory, but the one questionable element for some of you is the steaming the beet process. I highly recommend doing this ahead of time. Beets are messy and staining so proceed with caution. Simply chop off the ends and stems of the beats, peel with a vegetable peeler and then dice into nice 1/4-1/2 inch cubes. You can steam them on the stove top if you have a steamer, but since I don’t I steam them in my microwave(I know that’s weird…I own pie weights but no steamer. That says a lot about me, doesn’t it?). I put them in a medium sized bowl with 1 tablespoon or so of water (I don’t measure…no need), add a little salt and pepper, cover with a microwave safe plate and turn on the microwave for 2 minute increments, stir, and repeat until they are fork tender. Usually, this takes 4-5 minutes of steaming. Then I dump them in an ice water bath so the colors remain vibrant and refrigerate them for later to add to the salad. For the Golden Beets, everything is the same EXCEPT I add a 1/4 teaspoon of crushed rosemary in addition to salt and pepper BEFORE they steam. Try one after you steam it; It’s super yummy with rosemary. Put all ingredients in a bowl and whisk rapidly to create an emulsion. This is good to do ahead as well. Preheat oven to 375 degrees. 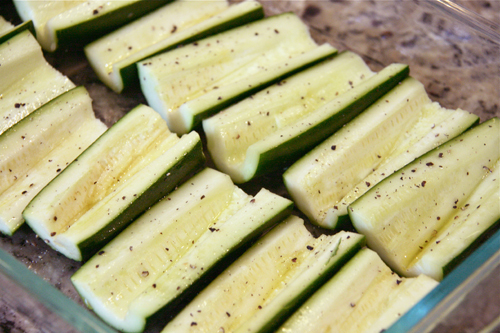 Chop off the ends and cut each zucchini in half lengthwise, from stem to bottom. 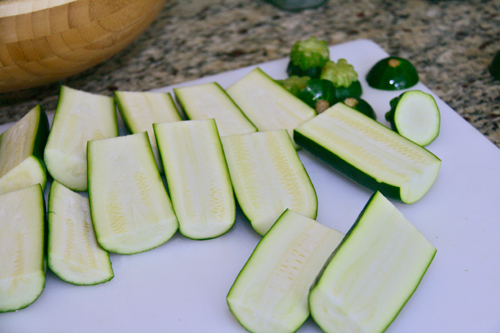 If I am serving them as a small portion, I cut the zucchini in half width-wise as well. Hollow out the center with a small spoon leaving about a 1/2 inch shell. Discard the removed zucchini if it is very seedy or cottony, or reserve if it is meaty. Brush the inside of the shells with a little olive oil and season with salt and pepper. Place shells on a baking sheet, cut side up, and bake until starting to soften, about 10-15 minutes. While the shells bake, cook the couscous. In a medium saute pan, heat about a tablespoon of olive oil and saute the onions until starting to soften. Then add the peppers and any reserved zucchini. Saute until tender about 4-5 minutes. Take out the pepper mixture and set aside. Add in the couscous to your empty saute pan and saute/toast the couscous for 3-4 minutes. Pour broth into a medium-sized pot and add toasted couscous. Bring to a boil, reduce heat to a low simmer and cook, stirring occasionally, until the liquid is absorbed and the couscous is tender, about 12 minutes. Stir in the reserved pepper mixture and the chopped mint and season with salt and pepper to taste. Mound the couscous mixture into the zucchini shells and return to the oven for another 10-12 minutes. You are quite correct! This salad is gorgeous! The salad looks – and sounds – delicious. Definitely worthy of being a cover girl salad! It looks pretty, but it contains beets (did you know that?) 😉 I just haven’t been able to get over my childhood aversion yet… I know I should just give them another try. We’ll see. Nice work! Just for the record, canned beets (the ones I am assuming from your childhood) give beets a bad rap. Fresh beets prepared either roasted or steamed are just slightly sweet, firm and quite different than their canned ugly cousin. Yeah, I know. I think it’s the smell I remember most… do the fresh ones smell, too? I don’t blame your book club for devouring that! Wow, the salad is lovely looking. I love the combination of dried fruit and beets in a salad. The fried chicken (below) looks fabulous as well. Could be dinner tonight. Your secret is safe with me Nina. I think I may have to try your ideas of sneaking in beets. That is gorgeous. I can’t get my wife to eat beets. Apparently she overdosed on them as a child. I know, I know. I love the dressing and the stuffed zucchini are amazing. I can’t wait to make those. Also, are we supposed to be modest when we blog? I will have to stop saying this recipe rocks at the start of every post! And yes she’s had the fresh. Just saw your earlier comment about childhood beets. I can understand why you weren’t quick enough for a shot, I’d have dove right into that salad. Fantastic! She certainly is a gorgeous cover model, and definitely has substance! I would dive right into this salad too! veggie meals ftw!!! looks delicious! This salad looks amazing! 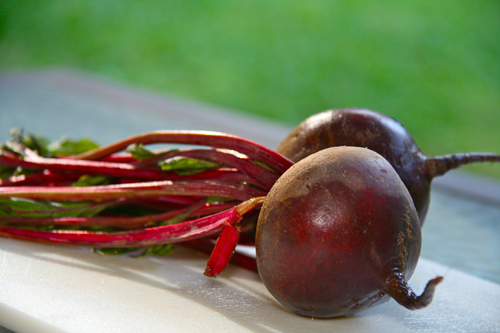 I adore fresh beets, and trying to serve them everyday in any form…Really tasty, healthy refreshing!!! Yes, that definitely deserves to be on the cover of any cooking magazines! Looks gorgeous! You sound totally sane to me! I do the same thing. I agonize about pictures, recipes, ingredients sitting in my fridge. Sigh. This salad is totally cover girl worthy though. I’d rather see it on the cover of my latest Vogue than whatever too-thin girl is on there. Lol, what a funny post. I also have that feeling sometimes specially when the wife and daughter is already hungry and I dont have much time to take 1 million shots. I always left with that feeling that I should have taken more. You always crack me up with your post titles. That salad looks delicious. It makes me wish the beets from my garden would hurry up and be ready 🙂 Have a good one, Geni! Love the name of this salad and you’re right, it’s a real looker! The two different kinds of beets add so much color (and yummy flavor!) and I love the sweetness from the dates! Yes indeed, it is gorgeous and so healthy! I can so relate to you and the photo taking, I’ve made many a dish I wished I could have held up the dinner for a photo! I’d say we are both passionate – not crazy! Geni, I love beets and like the idea of mixing both colors of beets. The salad sure looks great…beautifully done 🙂 Thanks for the tips using microwave to cook beets, I’ve been cooking on the stove and takes forever! The stuffed zucchini with couscous sounds really good. Have a great week ahead! This salad looks great, and I can’t imagine how good the original must have looked! Thank goodness you didn’t stop book group to take a photo. If I tried to do that with my book group, I think they’d eat my hand off. That salad really does look so healthy and fantastic. Bookmarking! That is a beautiful salad! Definitely want to try this one.